Jacob Gago has learned that he has to “look twice” before he crosses the street at another of the most dangerous intersections. Approximately 41 pedestrians lose their lives in Downtown LA’s Wilshire Boulevard and Flower Street intersection near where Mr. Gago works. He stated that many of these motorists are talking on their cell phones while they are driving. The California Judicial Council considered and addressed this issue previously and enacted 710 of the California Civil Jury Instructions, which is based upon both CA statutes and case law. According to this instruction that is entitled “Duties of Care for Pedestrians and Drivers,” motorists must take every precaution to avoid causing injury to pedestrians. This instruction acknowledges the fact that pedestrians need to be aware that a motor vehicle can cause great harm to them and that they must also conduct themselves cautiously when they are on the roads. However, the motorist must know that he or she can inflict great bodily harm or even death on a person with his or her vehicle. Therefore, the motorist has the responsibility of taking greater care than the pedestrian. According to California Vehicle Code 21950, pedestrians have the right-of-way. This means that drivers must stop their automobiles for pedestrians who wish to cross the street at a corner or a crosswalk. The crosswalk can be in the middle of the block. It does not have to be painted, and it does not have to have a traffic light. 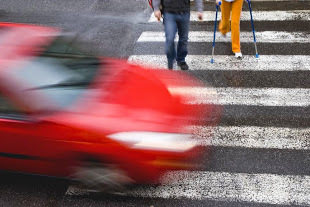 Furthermore, a motorist must exercise great care when approaching pedestrians who are crossing the street within a marked or unmarked crosswalk. Therefore, they are required to reduce their speed or take other precautions to ensure that the pedestrians are safe. This code also addresses pedestrians and how they must conduct themselves on the roads. For example, pedestrians must not suddenly dart into the street when vehicles are traveling in their direction. Walkers who are proceeding through a marked or unmarked crosswalk are not allowed to delay traffic unnecessarily or stop before they have safely reached the curb. Although the actions of pedestrians were addressed in subdivision (b) of vehicle code 21950, this does not mean that motorists are relieved of their duty to exercise caution around pedestrians at all times. Although the state of California has taken this issue very seriously and enacted several laws to decrease the danger to pedestrians, motorists do not always follow these rules. If you were hurt in a pedestrian accident or you lost a loved one, it is within your rights to call a pedestrian accident attorney today to fight for monetary compensation for your injuries. You may also be entitled to file a wrongful death claim with the at-fault driver’s insurance company. Whatever the case may be, your personal injury attorney will make sure that your voice is heard and that the insurance company does not take advantage of you.